HotSeat’s Edustation flight simulator is a realistic and full-featured flight simulator that is designed to integrate into all areas of STEM education. It is one of several models sold by the company. This particular model is designed for middle and high school students. It is self-contained and mobile so it can be shared among teachers in a variety of subjects. Quality and Effectiveness: The Edustation is well built and easily moved. The controls are sturdy and when they are combined with the large screen and headphones, it is easy to get a real-life flight experience. The system is truly a plug-and-play model that gets you up and running quickly. Everything is self-contained, so you just need to plug it in, start up the computer, and open the software. Ease of Use: The real power behind this product lies in the software. It is powered by Lockheed Martin’s Prepare3D flight software. The teacher can set the software so it can be tailored to a variety of skill levels. You can save and load flights that allow you to start in the air or on the ground. The hands-on controls give you everything you need for flight and the onscreen cockpit is interactive and realistic. Like any new skill, there is a learning curve, but the software can be adjusted to accommodate an aspiring pilot up to the most seasoned aviator. One thing I really liked is that you can turn off the crashing mode so the plane just “bounces” off the ground and the user can continue the flight. Creative Use of Technology: The Edustation simulator is a very innovative use of technology because of the realistic environments teachers can create (e.g., weather, terrain, and location) to teach STEM subjects at a variety of skill levels. Edustations can even be networked together to allow students to fly in groups or formations. From small planes to large commercial jets, there are a variety of aircraft to challenge students. While in the “cockpit,” there are controls that allow you to look around and change your views so you can get a real-life experience. Students can actually learn how to fly with the Edustation. HotSeat is also developing 30 STEM lab lessons for middle and high school students. Each lesson will be aligned to the Common Core standards and will be available in Fall 2014. Suitability for Use in a School Environment: The Edustation can fit into a variety of curricular areas, especially math and science. The unit is portable and easy to set up and run. The cost for a single unit may be challenging for some districts, but its portability makes it easy to share. The students will be motivated and standing in line to use it. • The realism of its flight simulation technology allows for flying in a variety of environments and locations. • It touches on many areas of STEM education, which gives teachers the flexibility to use it for a variety of topics and subjects. • The product’s portability and ease of use allow it to be shared by more than one classroom. This helps justify the cost for a single unit and reaches more students. 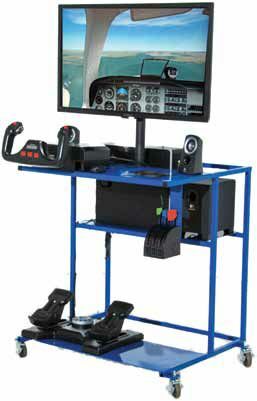 OVERALL RATING: HotSeat Chassis Edustation is a very innovative use of flight simulator technology that makes it fun to learn more about STEM subjects.